After the many loose horses at Skymont 2013, I have decided to go tech for insurance against the time my horses end up getting loose. Several years ago, Daniel and I purchased a Garmin Astro 220 dog tracking handheld unit. At the same time, we purchased 2 DC30 dog collars. The Astro 220 is now discontinued as are the DC30 dog collars. The dog collars were too short to use for horses and the collars themselves made of rough nylon, which discouraged me from using them for the horses themselves. However, Daniel would put a DC30 collar on the back of my saddle in case my horse decided to dump me and leave me. But Garmin has upgraded. Of course. Enter the DC40 dog collar. This collar is great! It is self-contained and can be put on any 1" biothane collar. Which means I can get collars that will fit the horses! The unit itself weighs only 5.1 oz, including the antenna. I bought 1 unit to test it out since it is compatible with my Astro 220 handheld. The Astro 320 is the new and improved handheld that is the upgrade of the Astro 220. We don't have a 320, but if we want another handheld, we'll purchase a 320. There is a DC50 collar, but it is bulkier and does not work with the Astro 220 handheld. The DC50 does boast better satellite reception as well as better battery life, but I decided the DC40 should work for our purposes. After charging the DC40 and painlessly linking it to my Astro 220 handheld, I retrieved a spare 1" dog collar from my box of dog goodies and used it to extend the length of the included DC40 collar. I then put it on Snap. The tracking unit is just heavy enough to keep the unit rotated down at the bottom of his neck, allowing the antenna to stick straight up. The antenna is attached to the collar by zip or twist ties to keep it from flopping all over and stay pointing up. Here's a view under his chin. You can see the lump doesn't really interfere with anything. The off side. This is 2 dog collars joined together to make it long enough for Snap's neck. If the testing bears out, we'll get color coded collars for each of the competition horses. Here you can see the data displayed about the horse. He's approximately 65 feet away. You can see the battery life, the GPS reception, as well as the communication strength with the handset itself. You can Select Go To to get an arrow that points right at him. This view shows the compass. The red arrow is Snap. The blue arrow is one of our old DC30s. I've turned my back on Snap and you can see this is telling me that Snap is behind me, slightly to the left and approximately 67 feet away. I left the tracking device on Snap until the battery died. The battery is a rechargeable battery, not regular AAs. However, the Astro 220 handheld does use 2 AA, so you can change those batteries on the fly. The DC40 battery lasted 27 hours 37 minutes transmitting his location every 5 seconds. Advertised battery life at that rate is 17 hours. I can extend battery life by changing the transmitting interval to 10, 30, or 120 seconds. I'm thinking 10 seconds should be plenty, resulting in a good battery life, while providing good updates if I'm actually trying to track him. You cannot change the tracking interval unless you're right next to the transmitter. So you can't set it to 120 seconds normally and bump it to 5 seconds after he runs off. I kept the Astro 220 in the house with me. Every now and again, I would turn on the Astro 220 and let it connect with the DC40 to see where Snap was. I could tell if he was just outside the window or at the very back of our property, likely checking out the hay I put out. The unit did not seem to slow Snap down at all. He was his usually jolly self, playing with Tanna, running pel mel up the hill for no apparent reason, and eating his supper out of his bucket. I pulled the GPS track from the DC40 onto the computer this morning. In 27 hours, Snap roamed for 5 hours and 12 minutes and was relatively still for the remainder of the time. He wandered 11 miles over his 3 acre field, playing with Tanna, moving with the herd and checking out the hay spots. All in all, I'm fairly pleased so far. Yes, there are downsides to this system. It's a line of sight system. So if I'm in a valley, but Snap is in another valley with a mountain between us, the Astro 220 handheld won't pick him up. However, if I move up the ridge line, I should start to get a bead on him and be able to head in his direction. I don't plan on tying Snap (or any of my horses) with the collar that holds the DC40. I would want to minimize any risk of that collar breaking and then him running off without the DC40. Next steps are to put the collar on the other horses and see how long the battery lasts and how the older horses take to having the collar on. If this all works out, we'll purchase an Astro 320 handheld (which is the 220 upgraded) and we'll have 2 handhelds which will allow Daniel and me to split up and cover more ground. I also was thinking about GPS options to attached to Rose at rides after so many horses getting out at Skymont. Will this unit work for remote locations like rides? Also for the secondary part of the collar did you actually purchase a horse collar or did you use a dog collar? Apparently my computer and I are not getting along. Sorry for the numerous comments but I am very curious about this. Looking at the device it appears that it is just the collar for sale. If the 220 is discontinued is there some sort of other hand held component that lets you track where your horse has gotten off to? "Will this unit work for remote locations like rides?" This system works on radio frequencies and GPS positioning, so is not dependent on cell phone coverage. The handheld and the dog unit communicate via line of sight radio signal. In my opinion, this type of system is the best option for finding loose animals in remote locations where cell phone coverage is not reliable or is nonexistent. There are other dog tracking systems out there, but I already have Garmin units, so went with the Garmin option for my tests. "Also for the secondary part of the collar did you actually purchase a horse collar or did you use a dog collar?" 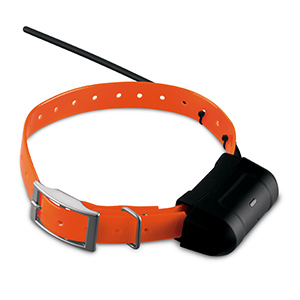 The orange collar that buckles around Snap's neck in the pics is actually 2 dog collars. One of them came with the dog unit; the other I had from another purchase. If I can find one, I plan to purchase a single horse collar that is long enough to go around Snap's neck without having to use 2 dog-length collars.
" If the 220 is discontinued is there some sort of other hand held component that lets you track where your horse has gotten off to?" Sorry for not being clear! I have updated the blog post to make it more clear that the Astro 320 handheld device is the new and improved handheld and replaced the 220. If we purchase another handheld, we will need to buy an Astro 320. I use a Garmin GTU10, also a dog tracking system, snapped on my horses bridle or halter. I can track from my phone or computer. So far, it works well.